Villa Necchi Campiglio is an absolute must see and a fascinating distraction during the Milan Furniture Fair. A visit to Villa Necchi Campiglio with its Rationalist architecture, extraordinary level of detailing and large collection of decorative arts (including Claudia Gian Ferrari’s early 20th century art and Alighiero De’ Micheli’s 18th century paintings), is a good way of understanding the cultural roots of Milan, a city built by industrialists and shaped by artistic patronage. Completed between 1932 and 1935 by Milanese architect Piero Portaluppi, and later expanded with a modernist addition by Gio Ponti collaborator Tomaso Buzzi, the sumptuous residence in the heart of the city is nestled between vast gardens, tennis courts and a swimming pool. 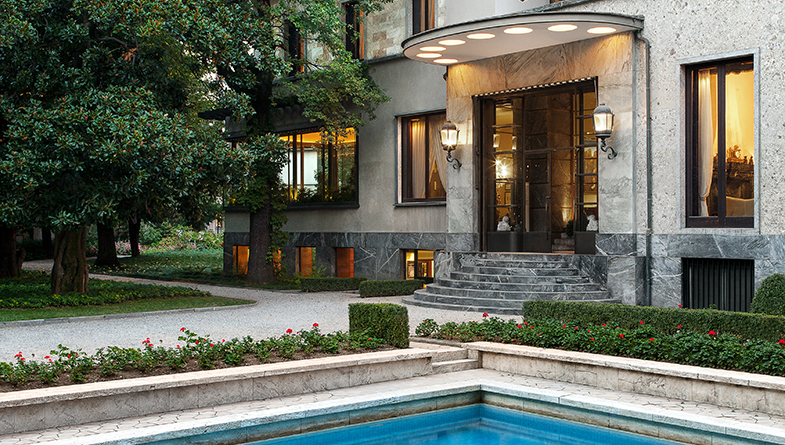 Not only the central figure in the 2009 film I am Love, Villa Necchi Campiglio is also closely connected to the Milanese design scene. In 2010 furniture brands including B&B Italia and Edra were chosen to show a selection of their key designs alongside the traditional furnishings inside the villa – pieces including Edra’s Brasilia table by Fernando and Humberto Campana, Mummy chair by Peter Traag, and B&B Italia’s Grande Papilio by Naoto Fukasawa. In 2001 the villa was bequeathed to the Fondo per l’Ambiente Italiano by Gigina Necchi Campiglio and Nedda Necchi and is now open to the public Wednesday to Sunday, 10am to 6pm. Joining Milan’s network of historic house museums – Museo Poldi Pezzoli, Museo Bagatti Valsecchi and Casa Museo Boschi Di Stafano.